Richland Township | Richland Township, located in Fairfield County Ohio. "Established in January of 1801, Richland Township was one of the first townships in Fairfield County. " Named after the richness and fertility of its soil. Located on the eastern side of Fairfield County Ohio, Richland Township is the smallest of the 13 townships in the County. Just 24 sections, 4 sections wide (east to west) and 6 sections from north to south, it is named for its fertile soils. Founded in 1805, history tells us that Zane’s Trace passed through Rushville, originally called Clintontown and West Rushville on its way through the early Ohio County. The Trace helped to establish the early farm trade of the township as well as general commerce. With its rich history and beautiful countryside, Richland Township is a great place to discover. Richland Township was established in January of 1801. It was one of the first townships in Fairfield County. It was named after the richness and fertility of its soil. It was cut down in size in 1817 and land from its eastern border was given to Perry County. Some early settlers of this township were Turner, Stevenson, Ijames, Teal, Geil, James Rowland, Jesse Rowles, and William Wiseman. 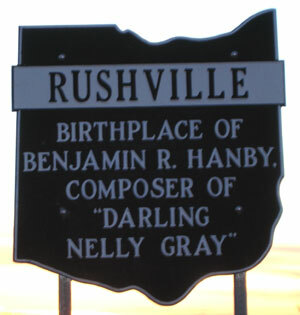 Rushville: Laid out by William Turner and established on May 26, 1808. Original name was Clinton Town. West Rushville: Laid out by John Ijams and established on February 27, 1817. Baker, Campground-Stevenson, Cloud, Custard-Parret, Drumm, Indian Mound, Kaufman-Valentine, Kennedy, Kerlin-Morrow, New Oakthorpe, Old Oakthorpe, Pleasant Hill, Reid-Stoltz, Roberts, Ruffner, Rushville, Sain, Saum-Winegardner, West Rushville, Woolard.